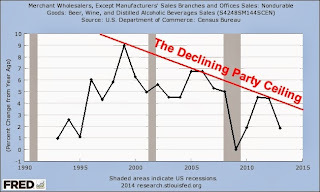 Deflation: Making Sure "It" Happens Here? 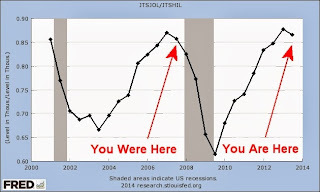 The Next Recession Arriving Right on Schedule? 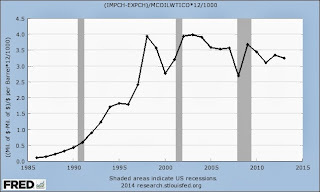 ISM: New Orders Are "Strong" and "Resilient"
The "Driver" of American "Prosperity"
The following chart shows the annual change in annual real disposable personal income per capita. 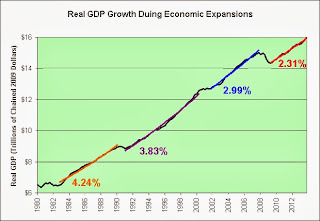 As seen in the chart, we have never successfully avoided a recession when this growth rate falls below 0%. The growth rate is currently 0.0% and falling. I see little reason to change my opinion. This is not investment advice. The following chart shows the 24 month moving average of real monthly manufacturers' new orders for computers and electronic products per capita (January 2014 dollars). Nasdaq 5000 here we come (again)! Well, sort of. 5,000 somethings are coming. After reporting better-than-expected quarterly results on Thursday, an Intel (NASDAQ:INTC) spokesperson confirmed to Reuters on Friday that the company plans to reduce its workforce by 5 percent, which accounts for 5,000 jobs. The spokesperson didn’t give a time frame for when the cuts would occur, but did say that they could happen through layoffs, attrition, and other means. In the final quarter of 2013, profits at the Santa Clara, California-based chipmaker rose. The company’s stronger results and industry data both suggest the struggling personal computer market has begun to stabilize. 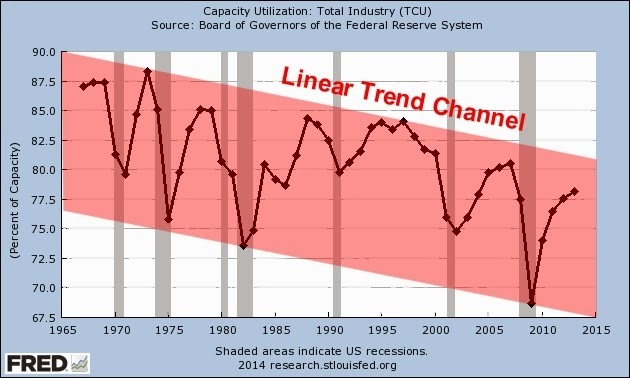 The realization of industry stabilization is clearly evident in the chart above. 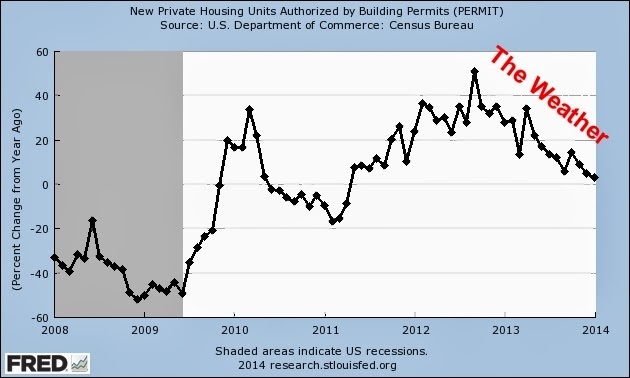 The following chart shows the annual growth in new private housing units authorized by building permits. 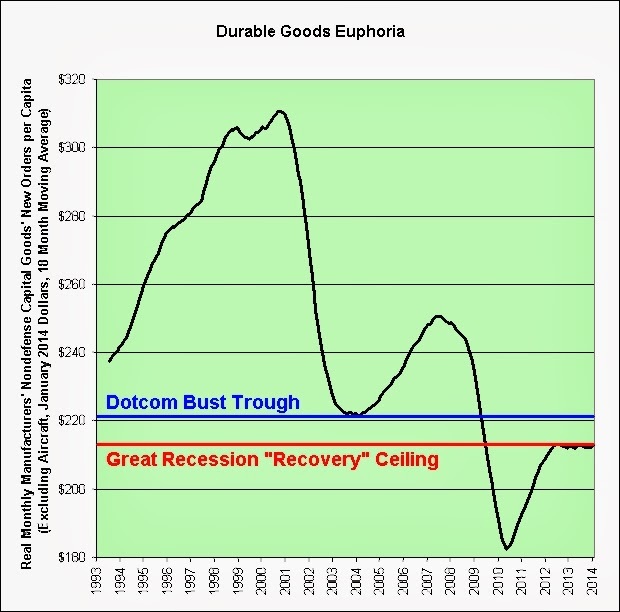 Orders for U.S. durable goods excluding the volatile transportation category unexpectedly climbed in January by the most in eight months, a sign manufacturing is emerging from a slump induced by harsh weather. The following chart shows the 18 month moving average of real monthly manufacturers' nondefense capital goods' new orders per capita (excluding aircraft, January 2014 dollars). Who in their right mind thinks "harsh weather" can explain an 18 month moving average that has been stagnant for 2 full years? 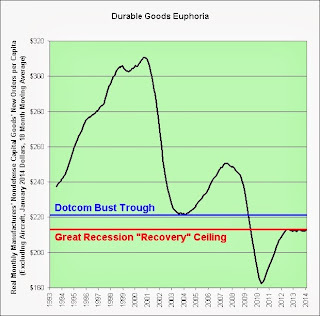 As seen in the chart, the Great Recession's "recovery" apparently can't even make it back to the trough of the dotcom bust. Durable goods orders in the U.S. have fallen by 1 percent m/m after commercial aircraft orders dropped by 20.2 percent m/m in January and motor vehicle orders declined by 2.2 percent m/m over the same period. With only 38 orders in January, hugely down from 318 in December, the Boeing Company (NYSE:BA) demonstrates a poor month in the famously volatile aircraft industry. Good thing I excluded aircraft from my chart. Wouldn't want people to wrongly assume that this permabear is a pessimist. Sigh. 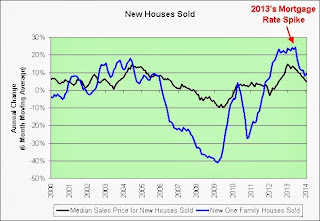 The black line shows the 6 month moving average of the annual change in the median sales price for new houses sold. Note that the growth rate has been slowing since the mortgage rate spike in the spring of 2013. 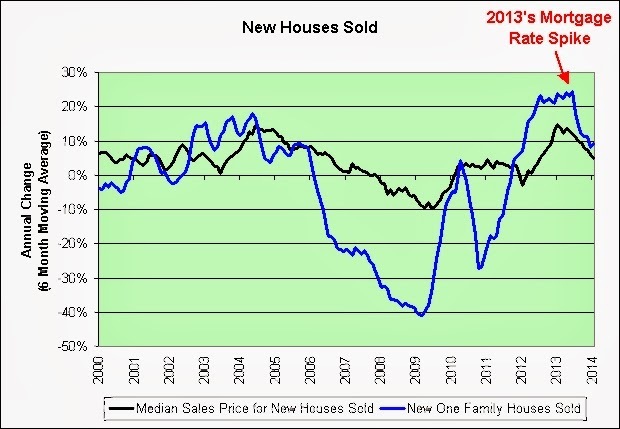 The blue line shows the 6 month moving average of the annual change in the number of new one family houses sold. Note that the growth rate has also been slowing since the mortgage rate spike. I'm told she's a strong and resilient economy though. We'll see. I dedicate the following musical tribute to our former Fed Chairman Ben Bernanke for daring to utter "taper" in the presence of a lady. The following chart shows the spread between commercial banks' interest rates on credit card plans (for accounts assessed interest) and the effective Federal Funds rate. The following chart shows the quarterly average of the purchase only house price index adjusted by the average hourly earnings of private production and nonsupervisory employees. The next chart shows the quarterly change. I have taken the liberty of modifying a real M1A2 TUSK Abrams tank to safely store one's virtual currency. The bitcoin access hatch (as can be seen on the front of the tank) can be camouflaged before delivery. This bitcoin safe's design emphasizes ease of use combined with TUSK (Tank Urban Survival Kit). 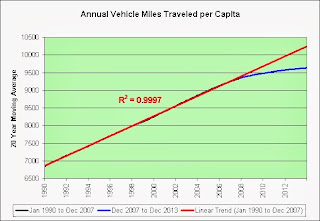 The following chart shows the 20 year moving average of annual miles traveled per capita. 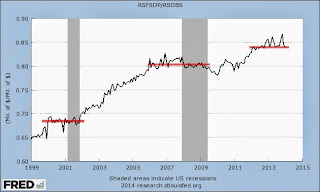 A trend line in red has been added. This is definitely the most impressive "sure thing" failure yet. 0.9997! Sis boom bah! Describe the sound made when a sheep explodes. Prices rallied 59 percent this year, the best performer in the Standard & Poor’s GSCI Spot Index of 24 commodities. But what can wake the sleeping giant? The chart shows the 10 year moving average of the Chicago Fed National Activity Index. This is an update to a post I did several years ago. 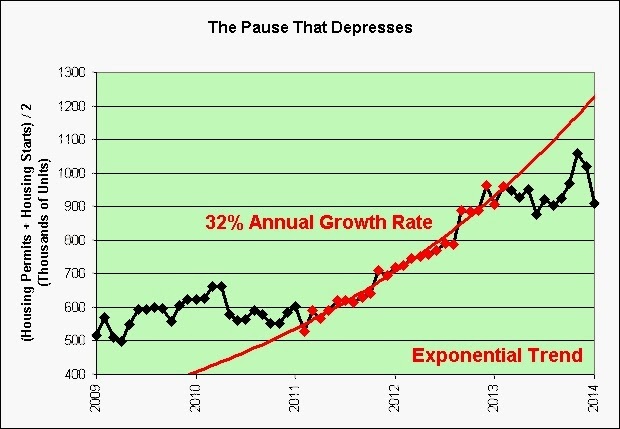 I promised an exponential trend that has not failed. Here it comes! We can get this ratio to infinity simply by continuing to shed manufacturing jobs faster than we shed financial activities jobs. It might not be as easy as it looks though. In hindsight, it has not been easy. 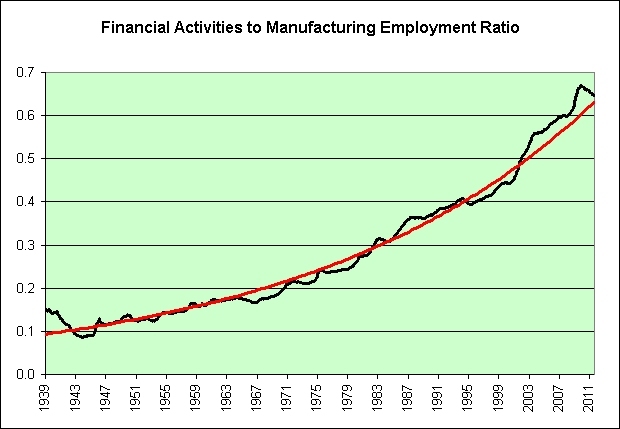 The following chart shows the natural log of financial activities employment divided by manufacturing employment. When using logs, constant exponential growth is seen as a straight line. This trend is in serious danger of failing. 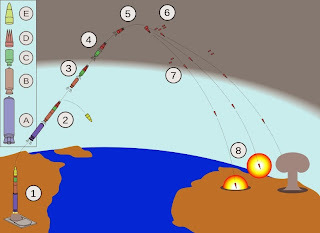 We're at the very bottom of the channel again. We last saw this heading into the dotcom bust. 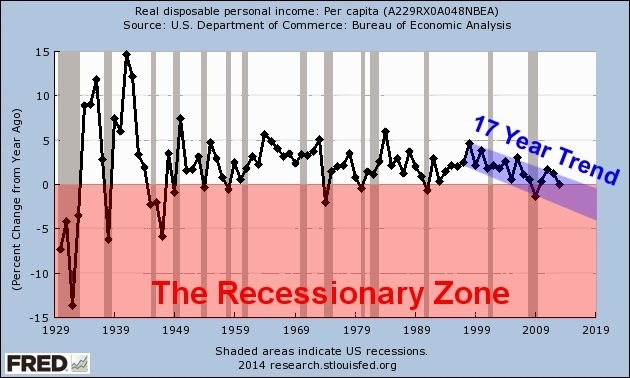 Before that we were heading into several recessions in the late 1970s. We also saw it as we were putting a man on the moon in 1969. Have we colonized the moon yet thanks to our ever growing prosperity? Or are we planning to put that off a few more years? Do not lose hope. 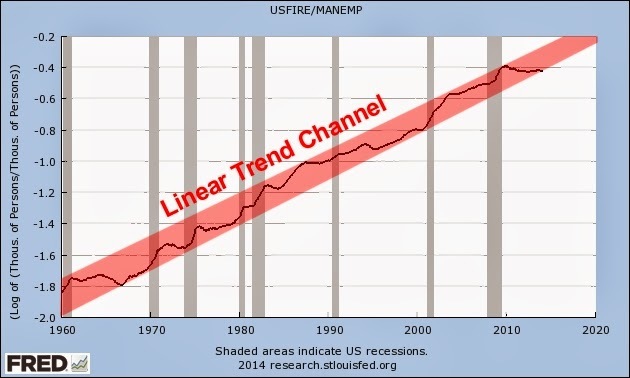 When Mr. FIRE Economy was asked about his recent under-performance relative to manufacturing (relative to the long-term trend) he exclaimed, "Give me recession or give me death!" 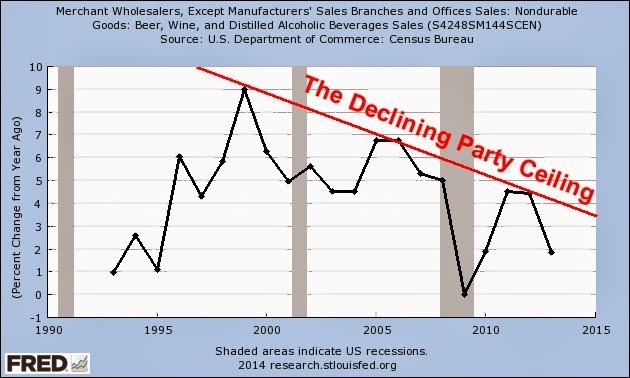 To which Mr. Manufacturing Economy laughed with great hubris, "Don't be silly! 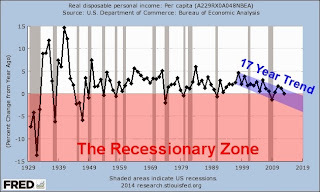 Our new and improved Fed has permanently put an end to all recessions! It's common knowledge. Everyone knows it. It really is different this time!" 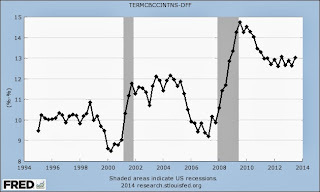 In all seriousness, note that the ratio tends to rise most during recessions as manufacturing employment plummets more than financial activities employment. 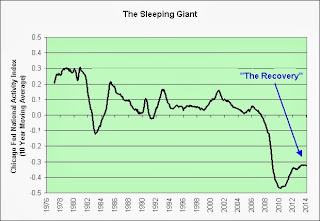 Being at the very bottom of the channel therefore puts us in "great" position for another legendary rise in the ratio. 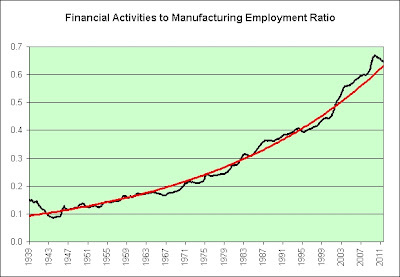 If the trend holds over the long-term (think fully automated manufacturing employment), then it is only a matter of time. 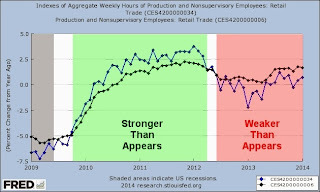 The following chart compares the growth in the number of retail production and nonsupervisory employees (in black) to the growth in the aggregate weekly hours worked by retail production and nonsupervisory employees (in blue). 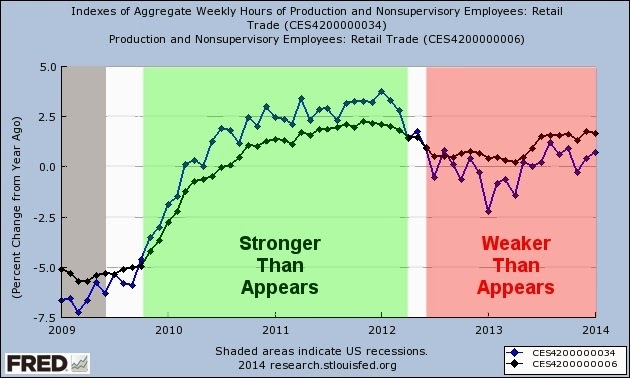 We have "successfully" transitioned to a "weaker than appears" retail employment economy. Get out the party hats. The following chart shows the annual change in the semiannual average of new one family homes sold in the West Census Region. What's the worst that could happen from here? Okay, sure. 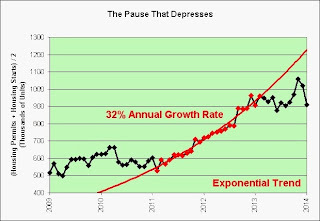 The growth rate is currently negative and has been falling for 18 months. That's just this winter's East Coast's polar vortex temporarily rippling back through space and time though. Any rational optimist can see that. 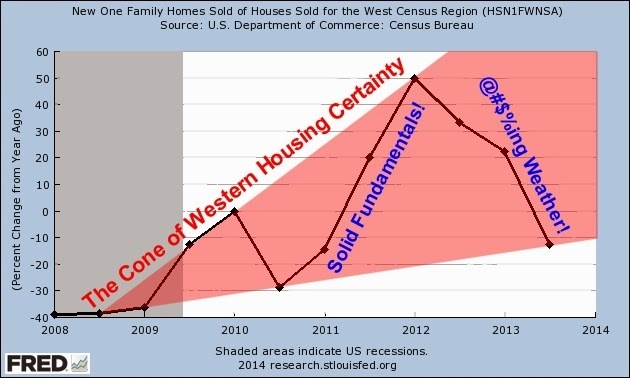 Further, we already knew that the East Coast's weather would carry over to existing home sales in the West. To think otherwise is just crazy talk! 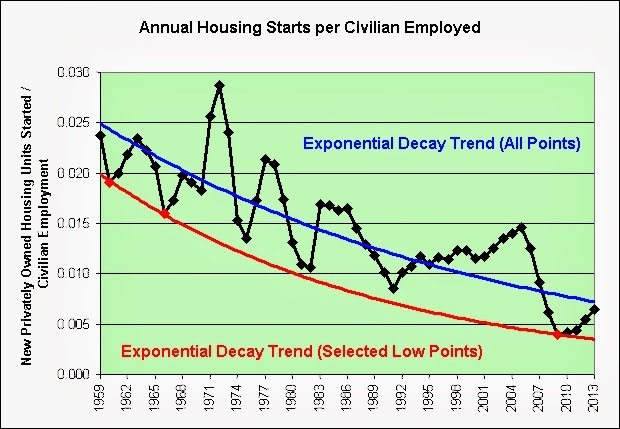 In all seriousness, the housing optimists better hope we not only stay in the channel but move back above 0% soon, or speculators may someday wish that they had embraced their fistfuls of dollars instead. 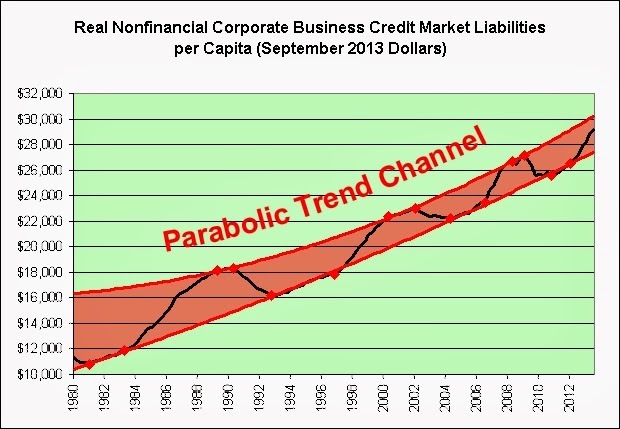 The following chart shows real nonfinancial corporate business credit market liabilities per capita (September 2013 dollars). 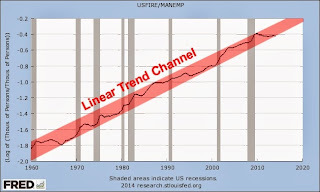 An exponential trend channel did not fit the data well at all but a parabolic trend sure did. 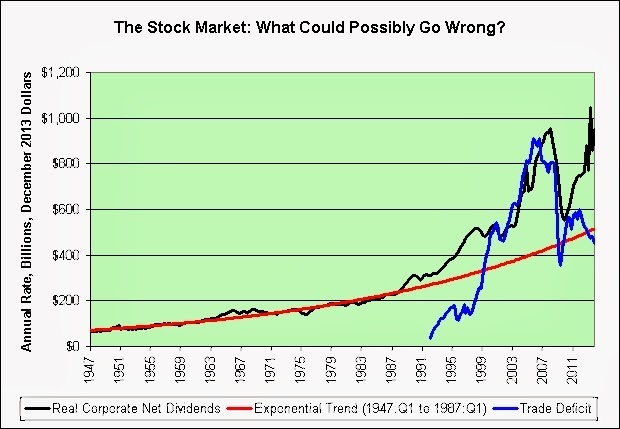 Parabolic moves are not sustainable over the long-term. This is a mathematical certainty. About the only thing open for debate here is the timing of the failure(s). There's a reason that so few of the companies in the S&P 500 still have AAA ratings. It is not something pointed out on CNBC though. No, sir. It's just piles and piles of corporate cash that's talked about. Why won't they spend their hoard? Blah, blah, blah, blah, blah. 1. Over the short-term, we're pretty much at the top of the channel again. This data ends in the 3rd quarter of 2013. Keep in mind that 5 months have elapsed since then. This is not even remotely the ideal investment environment that we saw in 1982 (where we were right at the bottom of the trend channel with plenty of room to grow). 2. Over the long-term, to put it bluntly, we are so @#$%ed. A parabolic advance will continue as long as there is an inflow of money to keep the move going. But, then at some point the inflow of funds begins to fade and when it does gravity sets in. It is at that point that price begins to soften. As price begins to soften the smarter money begins to exit and prices begin to soften more. 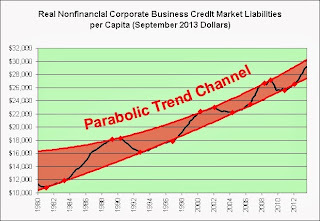 In the end all parabolic advances end pretty much the same and the late-comers to the party are typically left holding the bag. 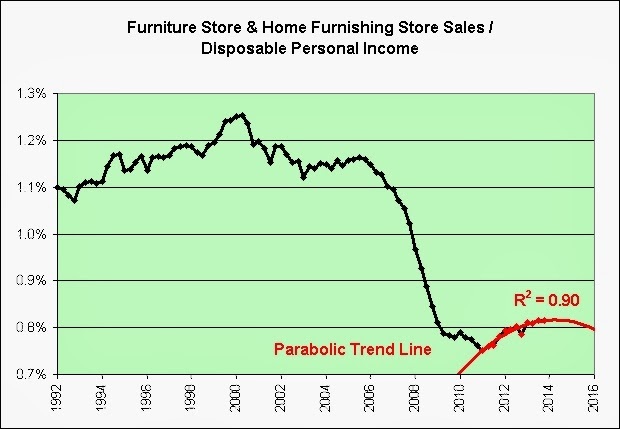 I can't say when the parabolic trend will fail (either in the short-term or the long-term) but I will say this. I became a permabear over debt concerns. I remain a permabear over debt concerns. 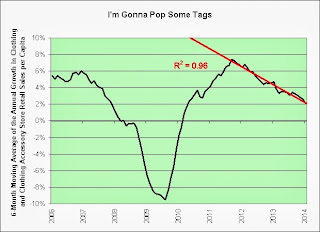 When the @#$% hits the fan again, and it certainly will if we continue to follow parabolic debt paths, then I'd much rather be owning "bubbly" inflation protected US treasuries backed by a monetary printing press than "bubbly" corporate debt backed by "private jets, office renovations, and custom-built commodes." Of course, that's just an opinion. Your opinion may vary. 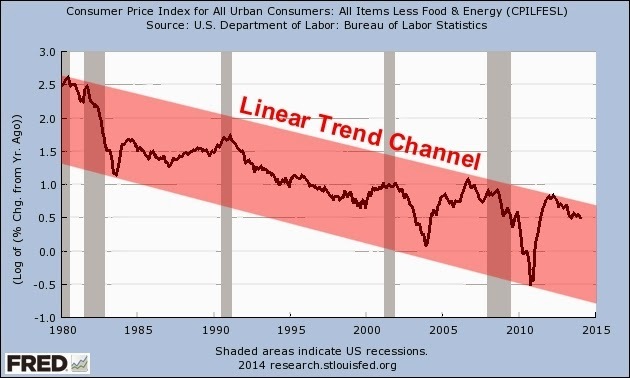 The following chart shows the natural log of annual change in the CPI less food and energy. 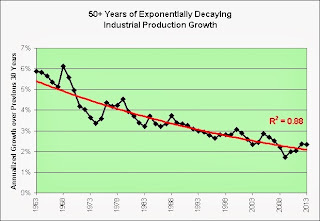 When using logs, exponential growth (or in this case, decay) is seen as a straight line. No matter how hard the Fed tries, it cannot seem to break through the top of the decaying trend channel. So what's the latest tactic? Taper! Good luck on that. Maybe it works. Maybe it doesn't. 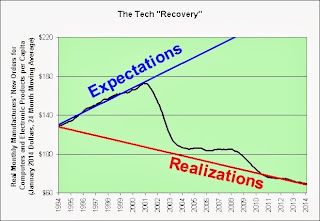 As seen in the following chart, the Fed has had substantially more "success" with energy though. 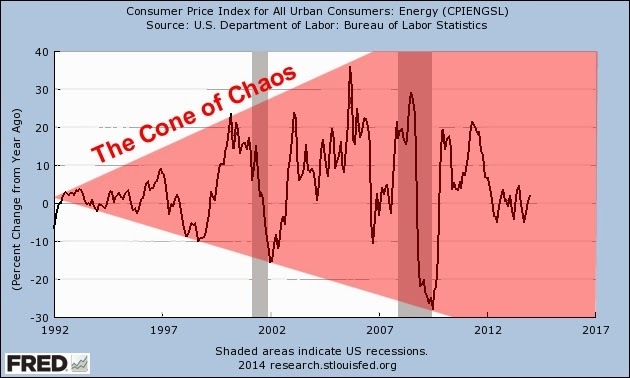 The chart shows the annual change in the CPI for energy (not the natural log). You will note that Bernanke did not mention wages or salaries in that paragraph, nor anywhere else in his speech for that matter. Perhaps the Fed's ability to decrease the value of a dollar is at best like a blunt hammer, and not a surgical instrument. It would also seem that our government is not all that determined to generate higher spending at a level that could guarantee positive inflation (much like Japan since their housing bust in the early 1990s). Perhaps $100 oil, massive debt relative to disposable personal income, and a congressional approval rating of just 12% has something to do with it. Go figure. I know not with what weapons Great Recession III will be fought, but Great Recession IV will be fought with sticks and stones. Sigh. The Fed isn't quite sure what threshold it should be using to determine when to raise interest rates. Can't say I blame them. I therefore thought I'd offer some free (deflationary) advice. 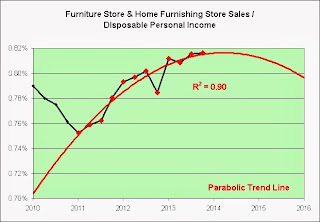 Furniture sales and new home sales go hand in hand. Right? 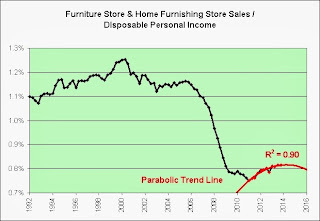 So simply raise rates when furniture store sales (as a percentage of disposable personal income) reach "normal" levels again. What could be easier? Transparent. Clean. Consistent. 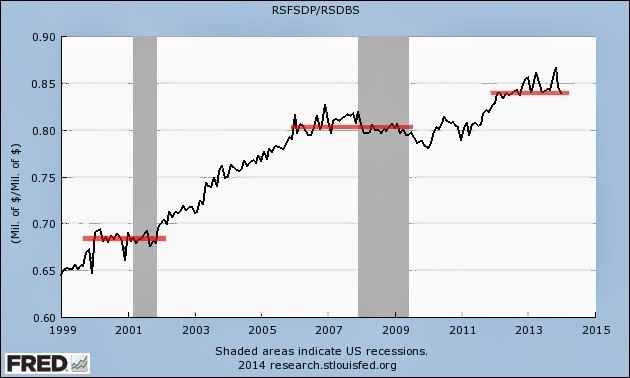 Let's zoom in on that recent trend in red and try to estimate how long it will take to get back to normal. The solution is clear. Raise rates just this side of never. Be just like Japan! 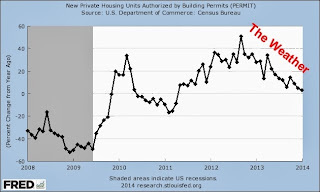 The following chart shows the average of new private housing units authorized by building permits and new privately owned housing units started. If cold weather is responsible for the exponential trend failure then, as seen in the chart, it sure has been cold over the past year. The following chart shows the annual growth in the S&P 500 Index divided by the annual growth in retail sales (excluding food services). I offer two data sets. One starts at 2004:Q1 (in black) and the other starts at 2010:Q2 (in blue). A parabolic trend line has been added for each series. 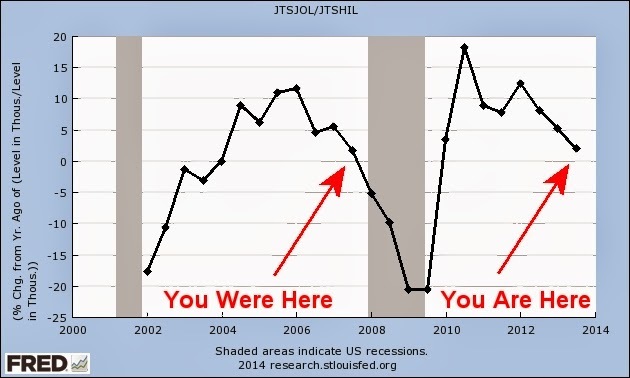 Note that both parabolic trends are nearly identical. So much for the "fool me once shame on you, fool me twice shame on me" theory to investing. 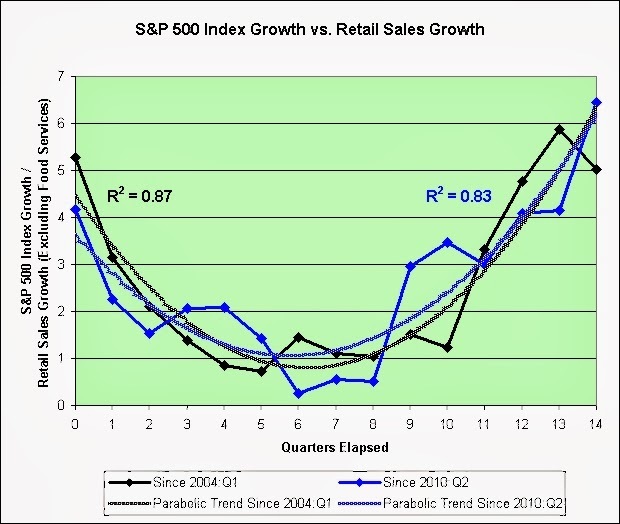 We are currently seeing each 1% of retail sales growth turn into 6% in S&P 500 Index growth (a 6-1 leverage ratio), just like we were heading into the Great Recession. That is not the most disturbing part though. It's how we got here and where investors seem to think we're headed. The future's so bright I gotta snipe hunt. 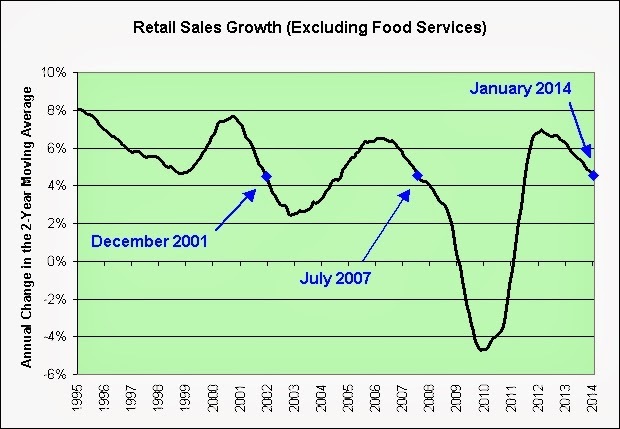 The following chart shows the annual change in the 2-year moving average of retail sales (excluding food services). I'm going for a maximum smoothing approach to remove as much noise as possible (while still seeing the underlying trend). Good luck blaming the slow and steady growth rate decline (since 2012) on this winter's weather. In May of 2012, I predicted that the next recession would hit on or before October 2014. Eight months to go. I see little reason to alter my opinion. At the rate we're going, it could be close enough for government work anyway. I truly hope I am wrong. Seriously. If I am right (might not be of course), this is going to be a nasty recession. Why? 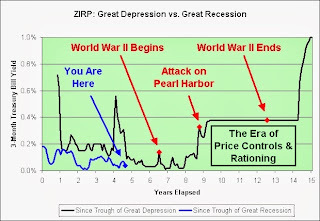 Many seem to think a recession is impossible during ZIRP and that the Fed has saved us. What a confidence shaking wake-up call that would be. I am especially amused by the party of 1999. 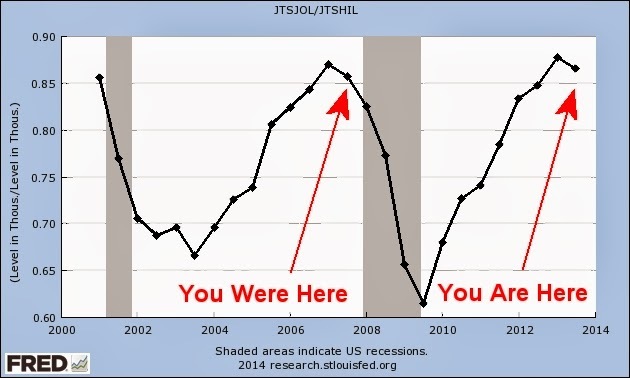 Had we not thrown such a spectacular one (and hoarded for the Y2K bug that was a non-event), the recession may have happened right then and there. Praise be to celebratory can-kicking. And lastly, rising interest rate environment my @$$. This is not investment advice. As always, just ugly charts and opinions. 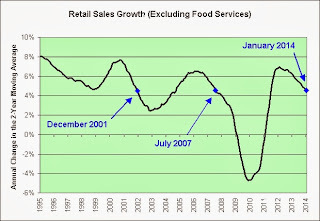 The following chart shows annual nonstore retail sales as a fraction of total retail sales (excluding food services). The growth trend is extrapolated out to 2050. I'm simply showing what the future will look like if the current trend continues. 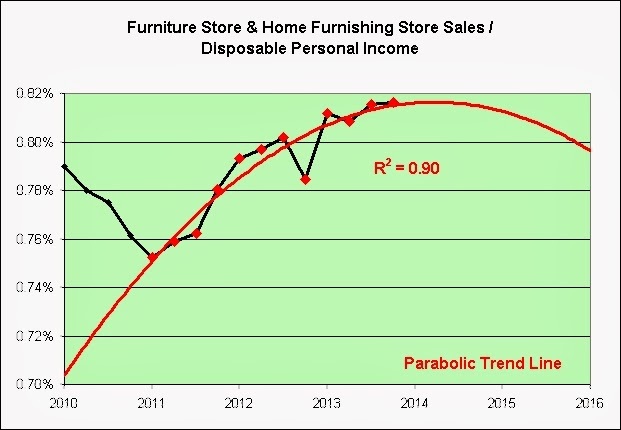 If 10% causes shopping mall pain now (which it clearly does), then what would 20% do in just 17 more years? Or 40% just 17 years after that? 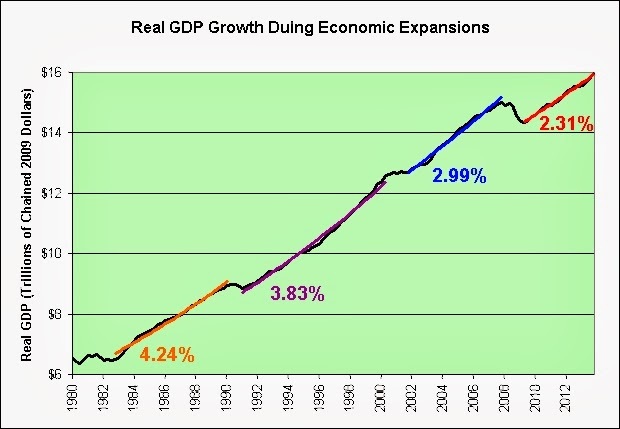 A 4.2% growth rate means that the thing growing doubles every 17 years. In this case, that thing is shopping mall pain. If you get stung by a bee and every 17 seconds you get stung by twice as many, how many minutes will it take before you realize that you're standing on a bee hive? How's that for optimism? 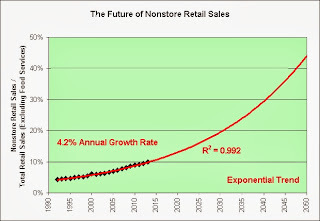 The following chart shows retail employees as a fraction of all nonfarm employees. Although there has been recent illusionary relative strength brought on by misplaced faith in the Fed to heal all that ails us, I fully expect the downward trend in red to continue. 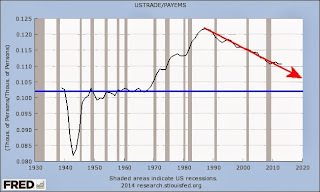 Further, I do not expect the blue trend line to offer any meaningful support to halt the decline. Now the ten massive REITs that own most of America’s malls are unwilling to invest the capital to reinvigorate older properties. 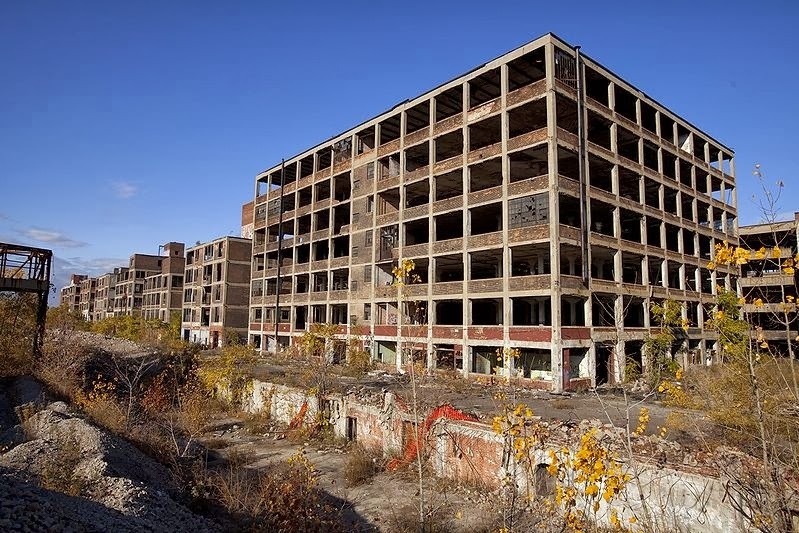 Bloomberg reports that the biggest REITs – including General Growth Properties, which declared bankruptcy during the financial crisis – are recovering and growing by divesting themselves of old, less prosperous malls and concentrating on the most profitable. Our older less prosperous economy is divesting itself of older less prosperous malls? Shocking. 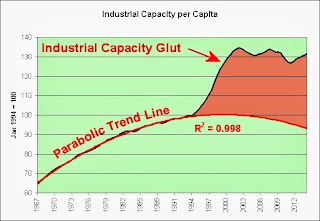 Great Depressionary Quote of the 21st Century: "Massive Industrial Overcapacity"
The following chart shows industrial capacity per capita (industrial production index adjusted for capacity utilization and population). That's a 0.998 correlation over 27 years of data (Jan 1967 to Jan 1994). And then... Boom! Trend broken big time. 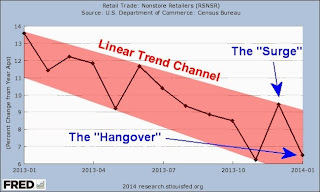 That has to be one of the most impressive trend failures I've ever posted on this blog. It was so incredibly consistent and predictable right up until it wasn't. It's not where we've been but where we are headed that concerns me most. Now that we have all this extra capacity, what's the worst that could happen from here? The accuracy of China's economic estimates faces growing doubts as the government tries to cut industrial overcapacity, recent reports suggest. Business models that have emphasised capacity expansion above all other considerations are now very exposed to changing patterns of demand. Rising capacity at aluminum plants in China, which account for almost half of world output, will weigh down prices this year in a market that’s already over-supplied, according to Fitch Ratings Ltd.
BEIJING: PetroChina has put off starting up two new refineries and delayed expansion of another to counter the threat of overcapacity as oil demand growth slows in the world's second largest oil consumer, a company official said on Thursday. China's oil consumption last year grew at its slowest in more than 20 years, calculations on government data showed on Monday, as soft economic growth sliced demand for transportation and industrial fuels such as diesel. The biggest obstacle facing China’s economy? Massive industrial overcapacity is near the top of the list as the country prepares to launch major reforms but seems intent on keeping gross domestic product growth from falling off too quickly. I have never been more permabearish. 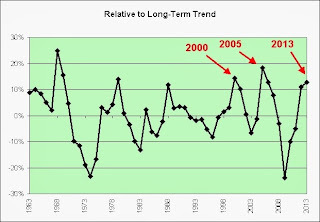 The next chart shows the long-term trend of those growth rates. 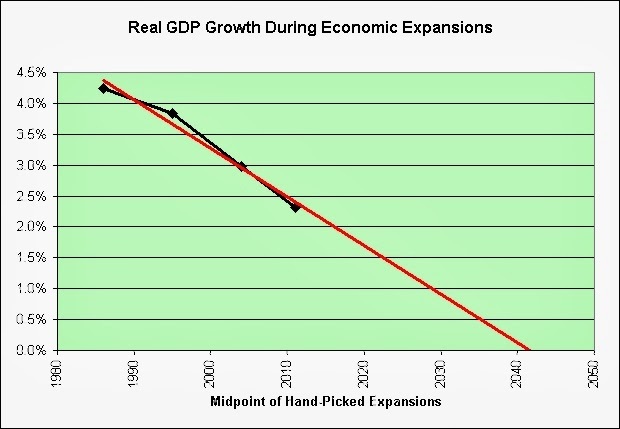 I'm using the midpoint of my hand-picked expansions as the x-axis. The most recent data point is open to serious revision. 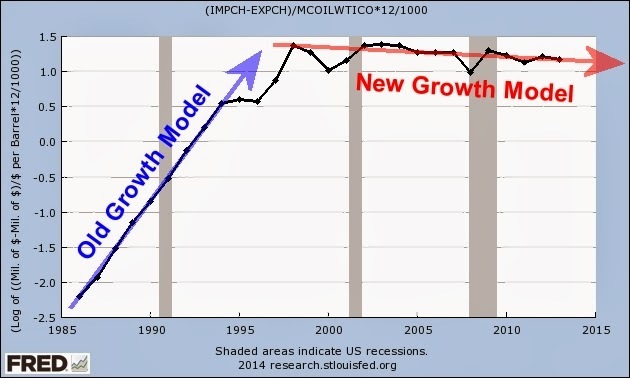 The growth rate probably won't change much, but the x-axis position may (it could move to the right on the chart). It really comes down to how long this expansion lasts. Real yields have fallen because real GDP growth has fallen (and continues to fall). It really is just that simple. Put another way, it is becoming harder and harder to make money off of money (current lofty stock market valuations notwithstanding). Those hoping for a return to normal better hope that the downward trend does not continue, because that's about the only normal thing going on right now. The future's so bright I gotta werewolves. The following chart shows the US trade deficit with China divided by the price of crude oil (annualized billions of barrels). It shows the amount of oil China could buy if they were to use their entire trade surplus with us to do so. That's assuming the price of oil would not be driven even higher in response to increased purchases of course, which is no doubt a bad assumption. 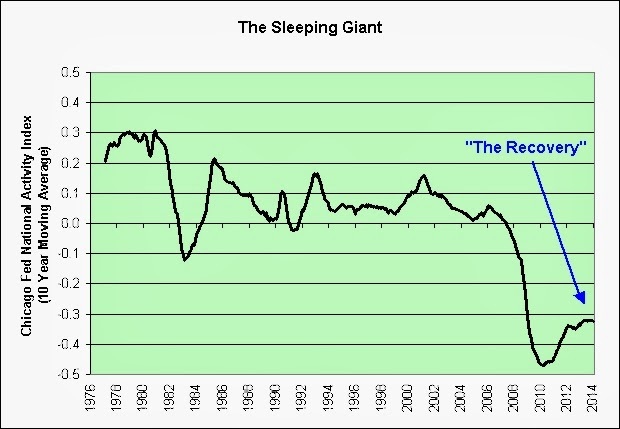 The next chart plots the natural log so that constant exponential growth can be seen as a straight line. 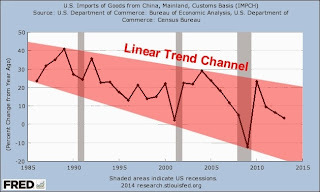 China "sent" us ever increasing amounts of stuff that we want, yet we do not seem to be returning the favor by sending them ever increasing amounts of the stuff that they want (barrels of oil). Note that I used "sent" instead of "sends." 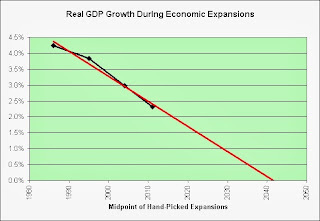 The next chart explains why. It shows the annual growth rate of imports from China. 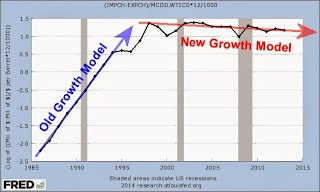 As seen in the chart, the nominal growth rate is just about dead now. The growth rate in the middle of the channel is roughly 0%, which oddly enough is what the Fed feels short-term interest rates should be over an "extended period." For what it is worth, I am not even remotely bullish on China (nor have I been since starting this blog in 2007). I also don't believe that I will ever feel the need to bribe a border guard to let me on the last plane to China. You know, as a desperate attempt to protect my future standard of living and freedoms (Patriot Act notwithstanding). Sigh. The line in black shows real net corporate dividends. 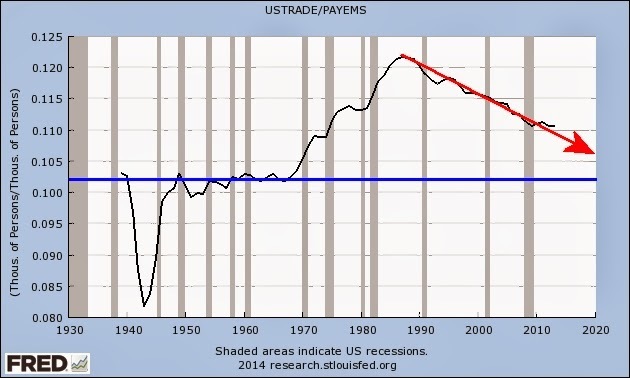 The line in blue shows the real trade deficit (same scale). 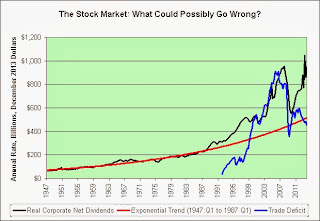 The red line shows the exponential trend in real dividends from 1947:Q1 to 1987:Q1. 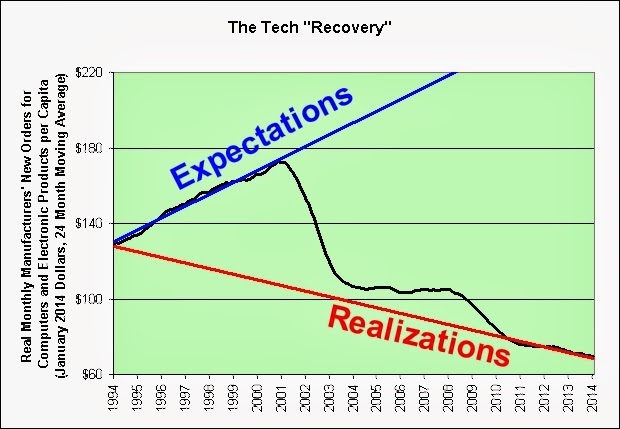 Note the exponential trend failure (to the upside). Will real dividends stay permanently elevated? 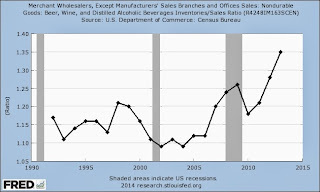 Will profit margins stay permanently elevated? Can we be assured that the worst is behind us? Can we expect future growth in real dividends to match the growth we've seen since the early 1990s? I wouldn't answer a resounding yes to any of those questions. Call me skeptical, to put it mildly. Instead, I would ask the following question. Will we someday, using the power of hindsight, discover that our massive trade deficit was not the permanent free lunch that it was advertised to be? Put another way, it really helped the corporate bottom line to transition from "Made in USA" to "Made in ____." Mission accomplished. Now what? 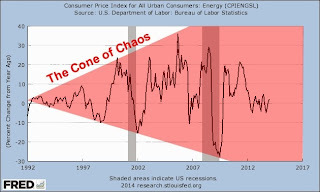 Persistently high oil prices (financial meltdowns notwithstanding)? 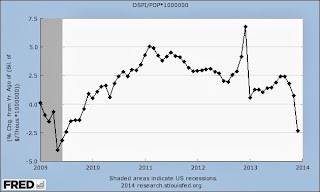 Persistently stagnant wage growth? 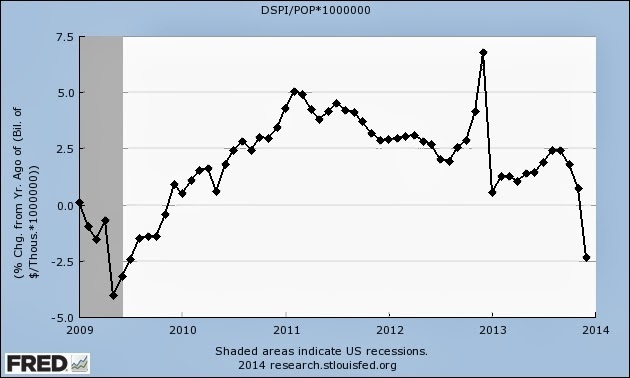 Persistently high unemployment? 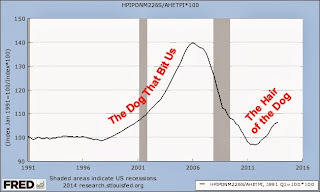 Increased rate of US (and/or global) financial meltdowns? 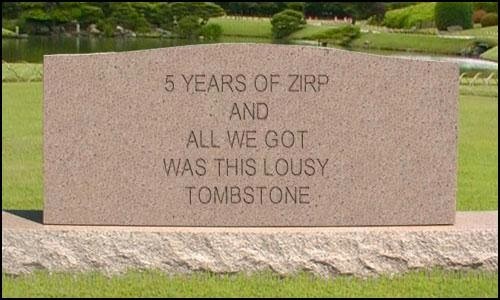 In and out of ZIRP from here on out (if ever out)? Even more giant sucking sounds? Lines of cars are pictured during a rush hour traffic jam on Guomao Bridge in Beijing July 11, 2013. CAAM last month said the auto market would likely grow 8-10 percent in 2014, echoing views from industry experts and analysts that 2014 would be another strong year for China's auto market. Other than corporate executives wishing to boost the value of their net worth and retire before the @#$% really hit(s) the fan, did anyone in power really think this through? The Chinese drive more. 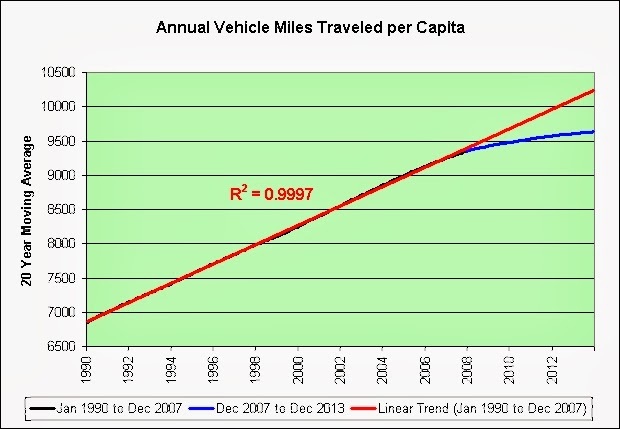 We drive less out of necessity (as seen in annual vehicle miles traveled per capita that fell apart during the Great Recession and has yet to make any sort of recovery). That's our plan for a more prosperous America? Seriously? The following chart shows the annual change in the semiannual average of the producer price index for finished goods. 1. 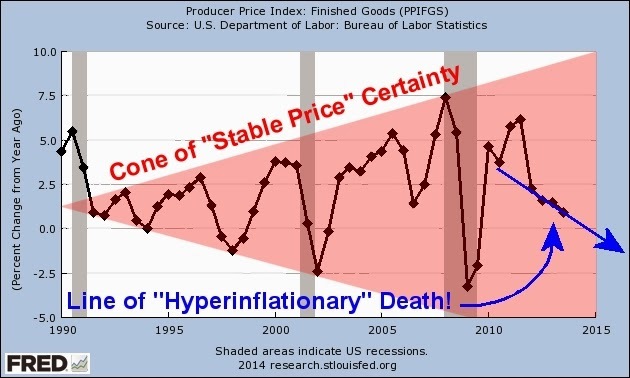 Heckle the Fed for achieving long-term "stable price" certainty? 2. 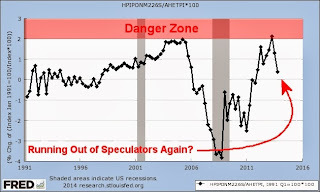 Heckle Jeremy Siegel for warning us that the Fed would raise rates well before 2014? 3. Heckle CNBC for warning us what the taper would do to interest rates? 4. Heckle Shadowstats for misguided hyperinflation theories? So many many targets! So little time. I may be forced to resort to Sarcastic ZIRP Technology! 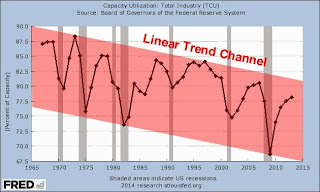 The following chart shows the annualized industrial production growth over the previous 30 years. 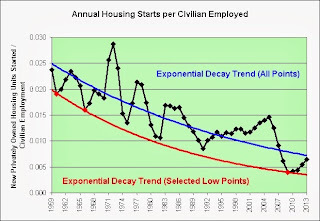 The next chart shows where we are relative to the exponential decay trend line. We're well above trend and it is not the first time. The following chart shows nonfarm payrolls divided by initial claims. I'm using quarterly averages to smooth things out a bit (1967:Q1 to 2013:Q4). In my opinion, the higher the ratio, the higher the potential for layoff surprises. 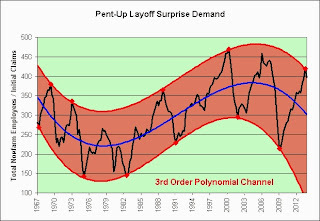 The 3rd order polynomial trend channel in red uses the red data points. The 3rd order polynomial trend in blue uses all the data points. 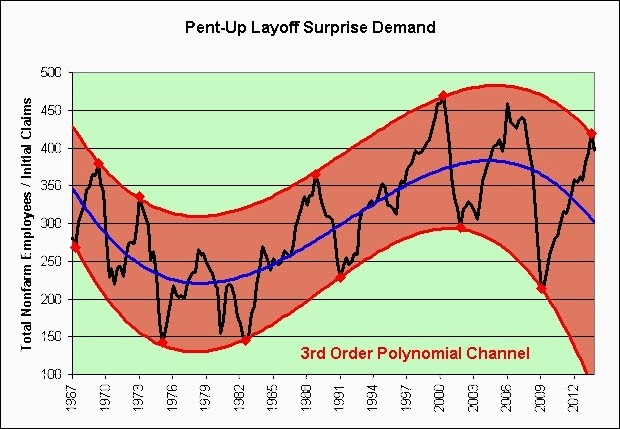 I would be among the last to argue that a 3rd order polynomial can accurately predict the future. It can't, especially over the long-term. That said, damn. It's an ugly chart. We all better hope there is absolutely no truth buried within it. 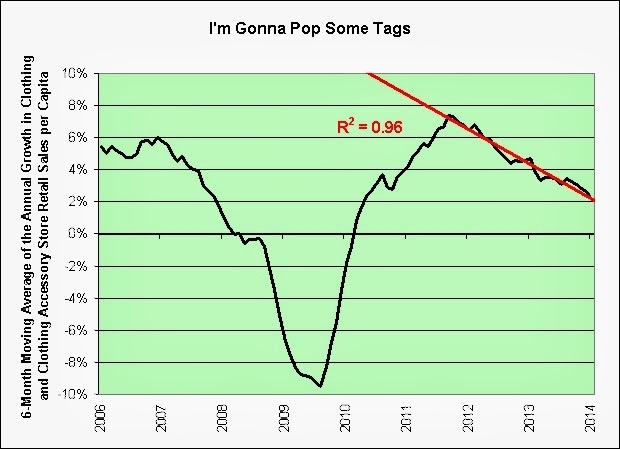 Unfortunately, as a permabear since 2004, I do believe there is some truth buried within it (or I would not have made the chart). How much truth remains to be seen. In any event, I would once again point out that this is not 1982. 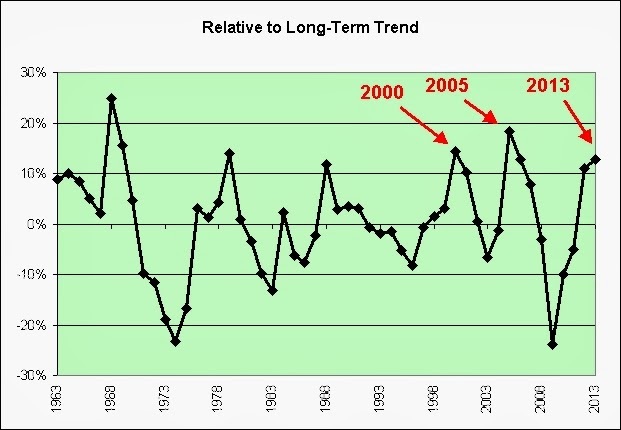 We are not at the very bottom of the long-term channel with favorable long-term tailwinds. 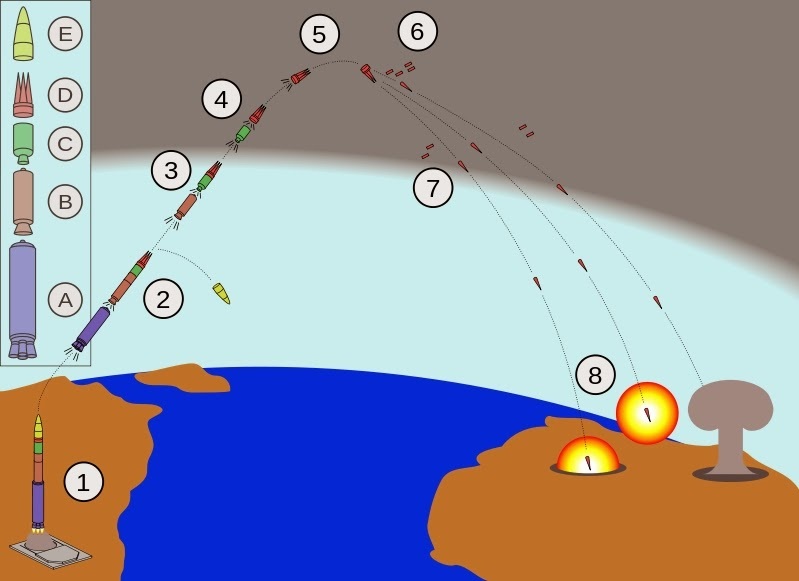 Instead, we are at the top of the channel with winds of a potentially different nature. Sigh. 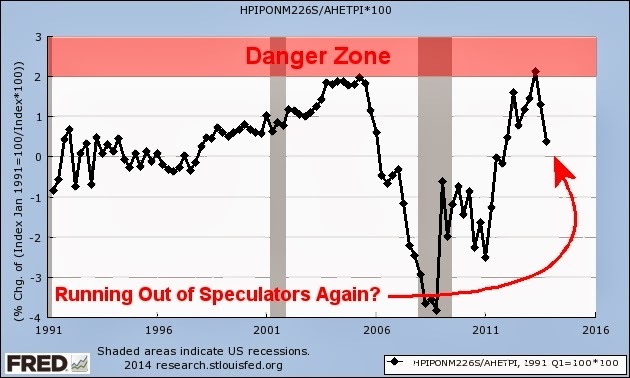 Is it really any wonder that we're still trapped in ZIRP? The following chart shows the 6-month moving average of the annual growth in clothing and clothing accessory store retail sales per capita. Keep in mind that it is not adjusted for inflation. We've experienced a lot of weather over the past few years. 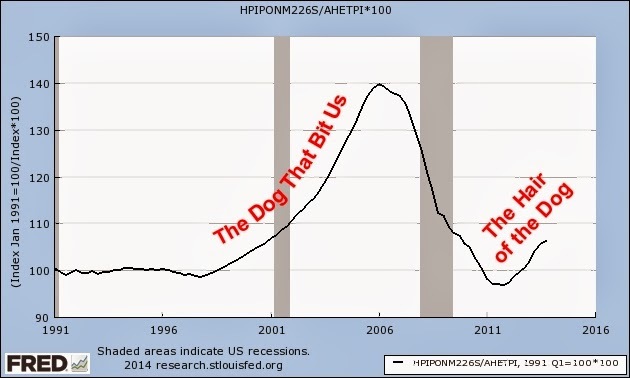 I doubt there's any reason to worry about the trend. The following chart shows the retail sales at food services and drinking places divided by the sales at food and beverage stores. Our service economy apparently requires us to grow the amount we spend at restaurants compared to the amount we spend at food and beverage stores. Put another way, our service economy requires ever increasing amounts of service lest we slip into recession. I know what you may be thinking. It was very cold. People stayed home. Okay, let's go with that and try a thought experiment. I shall be your consumption guinea pig. Buckle in. It's going to be an laboratory adventure! I'm sitting at home. The weather is too awful to leave the house. I'm a consumer, and man have I got some pent-up consumption demand. I'm sipping my hot chocolate. I'm looking over at my computer. I take a few more sips. I look at my computer again. I take another sip. I see a smart phone on the coffee table. I drink the last sip from a now empty mug. Empty! Bah! Say it isn't so! I can't stand it! I'm going to make a purchase and have it delivered to me! Snow be damned! It's the only way to end the agony! 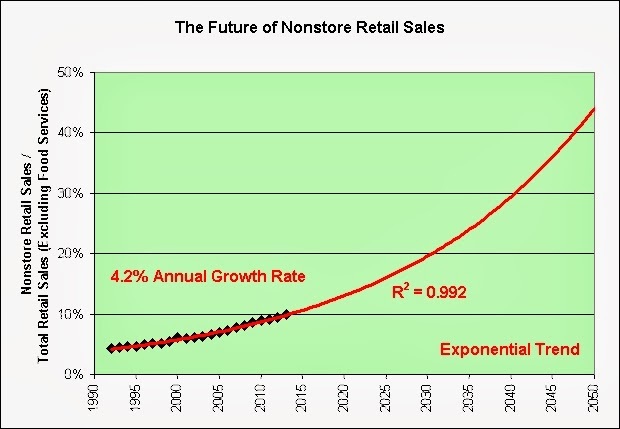 The following chart shows the annual growth in nonstore retail sales. We should definitely see the cold weather surge in all its glory! It must be there! Hmmm. There's a Christmas surge within a declining trend channel and a hangover to go with it. That's not quite what we were looking for with our optimistic cold weather theory. Oh, well. Can't say we didn't try! It is just like cash, only it isn't cash. It's a professionally managed bond fund! Genius! Check out the fund's chart. What's not to like? $2.4 billion in assets! Very popular! Focus as you patiently await the end of ZIRP! 5 years so far! But we really, really, really mean it this time! It's at an end! Cutting out! Kaput! Finished! Drop the curtain! Break camp! Pull up stakes! Finis! Absolutely, positively it! Not pulling your leg! Down the road! We swear we won't ever be back! Ain't gonna happen! Forget about it! Shutting it down! Lost our lease! Can't find it! Don't care! We're done! Closing shop! Putting up the shutters! Bolting the doors! Slamming them closed! Gonna board the place up! Nailing it shut! Big nails! Nothing gets in or out! Sealing it off! We're history! We really! Really! Really! Mean it! We're not jerking your chain on this! No snow job! Not bluffing! No kidding! The following chart compares the 3-month treasury bill yield in the aftermath of the Great Depression to the 3-month treasury bill yield in the aftermath of the Great Recession. 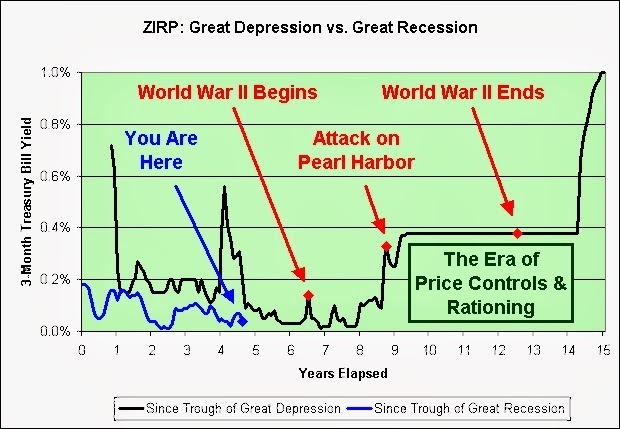 For the record, I am not predicting World War III (nor would I expect it to even remotely solve our long-term ZIRP problem as effectively as World War II did). I think you can see why I might be fond of ultra long-term inflation protected treasuries and I-Bonds. You might also understand why I might be somewhat skeptical of rising interest rate theories. I believe we are trapped in ZIRP much like Japan has been since their housing bubble popped in the early 1990s (which will become all too apparent when the next recession hits, whenever that is). We might temporarily escape from our padded cell at some point, but we'll never get the straight-jacket off, much less get past the search lights, the dogs, the barbed wire fences, and Janet Yellen, our trusted security guard. That's just asking too much, lol. Sigh. Monetary policy is hard enough without having to worry about the spillover effects to other countries that should take care of themselves. Contrary to the opinion of those who think the stock market continues to go up easily from here and that vast riches await those willing to swing for the fences at any price, monetary policy is hard. For what it is worth, that's what I'm reading into what she has to say anyway. 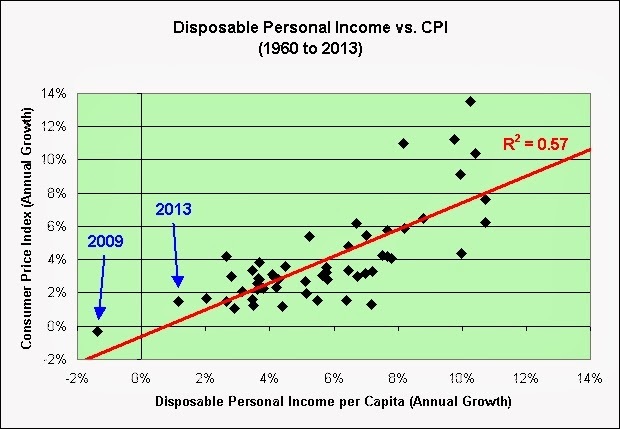 The following scatter chart compares annual disposable personal income per capita growth (bottom scale) to the annual increase in the consumer price index (left scale). 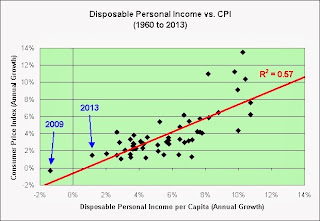 The following chart shows recent annual disposable personal income per capita growth. I'm using the monthly data instead of the annual averages this time to more adequately show all the gory details. WASHINGTON (MarketWatch)-- St. Louis Fed President James Bullard said Friday he expects inflation to pick up this year, despite having been surprised by lower prices last year. 1. Good luck on that inflation theory! 2. Brace for more surprises! 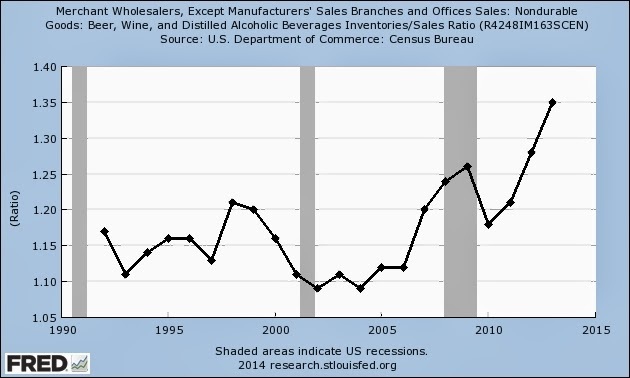 The following chart shows the annual change in beer, wine, and distilled alcoholic beverage wholesalers' sales. 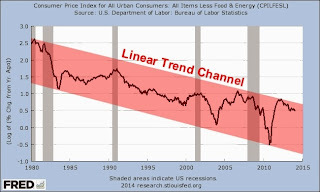 Don't let the trend line concern you. As seen in the next chart, I assure you that we are more than prepared to throw a legendary party! Just look at all that inventory accumulation. Yes, sir. Somebody must know something. The party's definitely coming! The following chart shows the semiannual average of the number of job openings divided by the number of hires (as seen in the Job Openings and Labor Turnover Survey). Note that this ratio appears to be a leading indicator for the last two recessions (too bad there isn't more data to backtest it further). 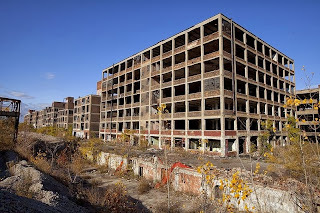 When the view out the front window (job openings) looks worse than the view out the rear window (hires), then there may be reason for concern (again). The next chart shows the annual percentage change in the semiannual data. Let me guess. We can blame the "recent" decline on two years of bad weather? The financial experts are bracing for this economy to accelerate in 2014. I have but one question. Which direction? Sigh.